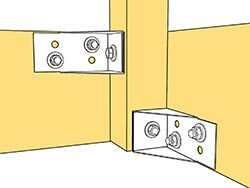 What is the DeckLok® Advanced Lateral Anchor System? DeckLok is a lateral anchor system that secures deck components to the structure of the deck in a way that is revolutionizing the deck industry. 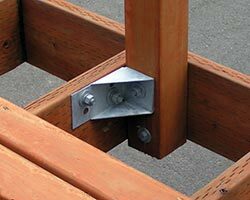 This patented lateral anchor system strengthens the vulnerable connections between deck components by adding a bolted attachment at critical structural locations. Current deck fastening techniques rely on resistance to "pullout" force... like using a nail to hold a crowbar. 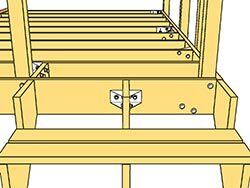 The DeckLok Advanced Lateral Anchor System creates stronger deck connections by redirecting the force of the load from "pullout" to a connection in "shear" at the deck floor joist. 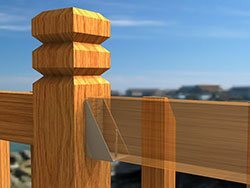 The DeckLok Lateral Anchor System provides the strength required to meet or exceed IRC and IBC 2006, 2009 and 2012 Safety Code requirements for both lateral pullout and rail post stability while using your current deck construction techniques and designs. The lateral anchor is available in ACQ compatible galvanized coating and in 316 Stainless Steel. 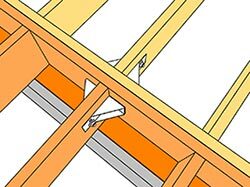 The Advantage: One DeckLok lateral anchor = 500% increase in rail post strength, two DeckLok Lateral Anchors = 4,000 lbs of ledger board pullout resistance! Thank you, Finally a system that makes sense!